Despite rain delays, our recent Crawfish Boil on the Rue was a huge success, raising more than $1,500 for the North Texas Food Bank. 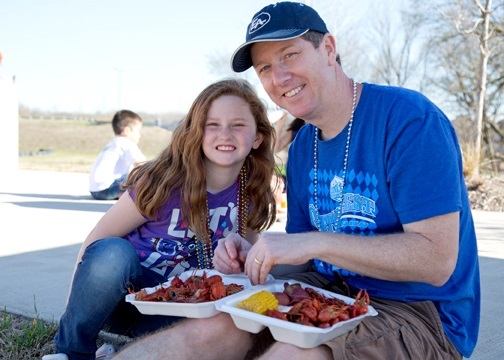 More than 1,500 people paid $1 to enjoy 2,200 pounds of crawfish — not to mention yummy sides like potatoes and corn. Since we donated all the proceeds to NTFB and every dollar donated provides three meals to local North Texas adults and children, we were able to raise enough money to deliver approximately 4,500 meals! Your generosity helped deliver meals, and we think Trinity Falls delivered tons of fun in the form of the Moving Colors band, pedi-cab tours of B.B. Owen Park, street performers, balloon artists, a stilt walker, a bounce house, a photo bus, food trucks and more. Several local breweries and wineries offered wine and beer for sale. While you were here, did you get a chance to see our gorgeous model homes? Ashton Woods, Gehan Homes, Chesmar Homes, Highland Homes, Meritage Homes, Plantation Homes and Perry Homes all build here and all of them are ready to build your dream home. We hope you came hungry and left happy. Thank you for supporting the North Texas Food Bank. We’ll see you next year!